5 1/4" wide and 60" long (excluding fringe). 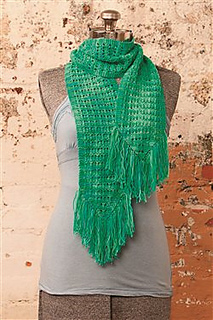 -Finished Size: 5 1/4” wide and 60” long (excluding fringe). -Yarn: Lorna’s Laces Shepherd Sock (80% wool, 20% nylon; 435 yd 398 m/3 1/2 oz 100 g): #412 campbell, 1 skein. -Needles: Size 6 (4 mm). Adjust needle size if necessary to obtain the correct gauge. -Notions: Tapestry needle; crochet hook. 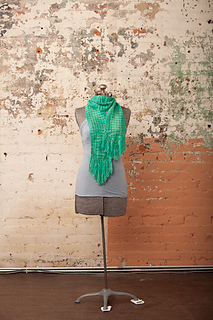 -Gauge: 25 sts and 36 rows = 4” in Body patt, blocked. 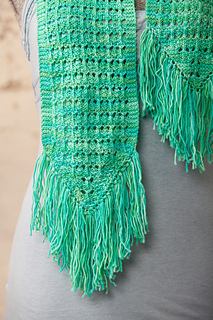 Bordered lace and fringed ends work together to make a fun and textured scarf.